Racing was cancelled due to weather and will not be rescheduled. Look for a new date in 2020! you can still help carry on Jeff's legacy by making a donation. Liz Fletcher, a Sea Scout and avid sailor who learned from Jeff, wanted to hold a sailing event to honor her friend's memory. 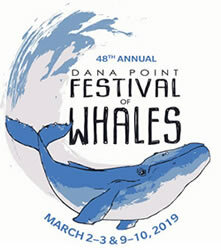 Dana Point Yacht Club had traditionally held a junior regatta during the harbor's Festival of Whales with the winner's name added to a very beautiful perpetual trophy displayed in the yacht club's lobby. Jeffrey Adam had won that trophy so many times that it was fitting to rename the Festival of Whales Junior Regatta the Jeffrey Adam Memorial Regatta (JAMR). Liz earned the Sea Scout rank of Quarter Master (similar to the Boy Scout Eagle Scout) with her work which established what has become an annual event held for the benefit of youth sailing in Dana Point Harbor. The fact that Liz, as a high school student, could successfully take on such a project, is indicative of the capable youth Jeff called friends and the high quality of young people coming from the junior sailing programs in our harbor. 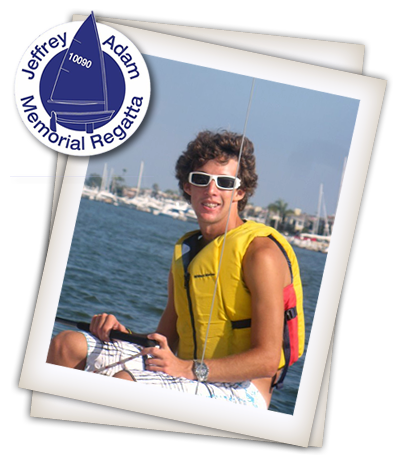 Now, in partnership with the Dana Point Harbor Youth Foundation, Jeffrey Adam Memorial Regatta has a goal of instituting new cooperative programs for all youth sailing in Dana Point Harbor. 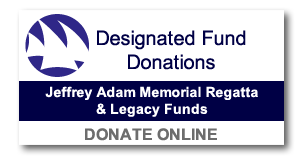 Proceeds from the Jeffrey Adam Memorial Regatta have lent significantly to the purchase of boats and sails that are being used by youth from five of our local high schools. Scholarships have been awarded to deserving young sailors and these young teams are competing with all the well-established high school teams based in Southern California. The Sea Scouts employed their funds to continue offering such programs as their summer "long cruise" up the coast of Southern California on the tall ship 'The Spirit of Dana' and sending a record number of qualified competitors to the 2016 Koch Cup which is the Sea Scout's biannual international regatta. They look forward to the summer 2019 Koch Cup where they anticipate a strong performance. The Foundation has additionally purchased a fleet of boats for the youngest sailors in the harbor. If any of our guests remember the very first Jeff Adam Regatta, they may have their own stories of boats losing rudders and breaking parts as soon as they left the dock on that windy day. Six years later, our local youth can now count on solid equipment on which to learn to sail. DPHYF is helping to build a foundation for a culture of youth sailing that fosters responsibility and develops life skills with friendships and memories to last a lifetime. With such a culture, we can expect our youth will grow into such fine adults that they will make their community proud.